Morning ladies today I thought we'd take a look at boho tops. 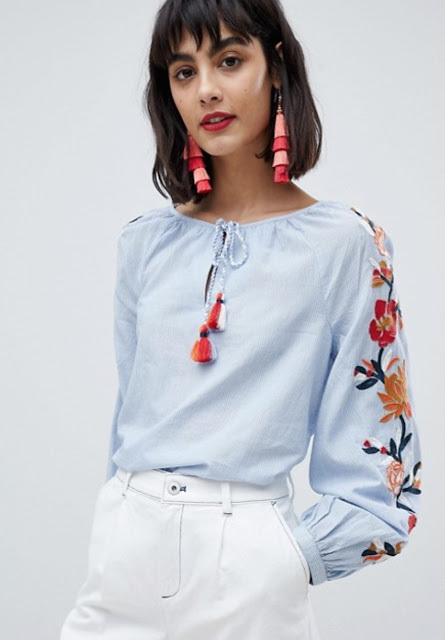 The sort that are easy to throw on with a pair of jeans (boyfriend or skinny) & either heels or flat sandals that are perfect for days/nights out when you don't know what to wear. Starting with this stunning red embroidered number that is sure to make a statement. Plus not only does it have embroidery it has ruffles too! 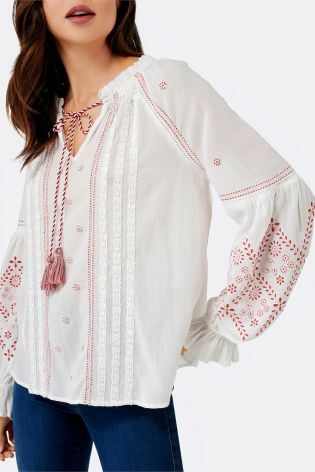 If however, you prefer something a little simpler then the above white blouse with red embroidery is ideal. Personally I'd style the top with the front centre part tucked in & the neck ties undone as I think this is just a much more stylish & flattering way to wear this trend. 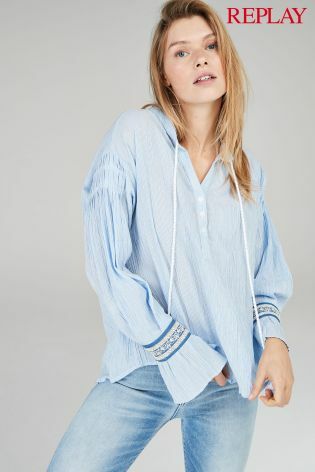 A similar top to the one above but this one comes without neck ties, which if you have a habit of catching them in drawers/doors like I've been known to, may just be a little more appealing. Cap sleeves next & I must admit I'm loving this one, which might have something to do with the gorgeous green embroidery. Just perfect for summer holidays & throwing on with a pair of denim shorts, flip flops & a panama hat. 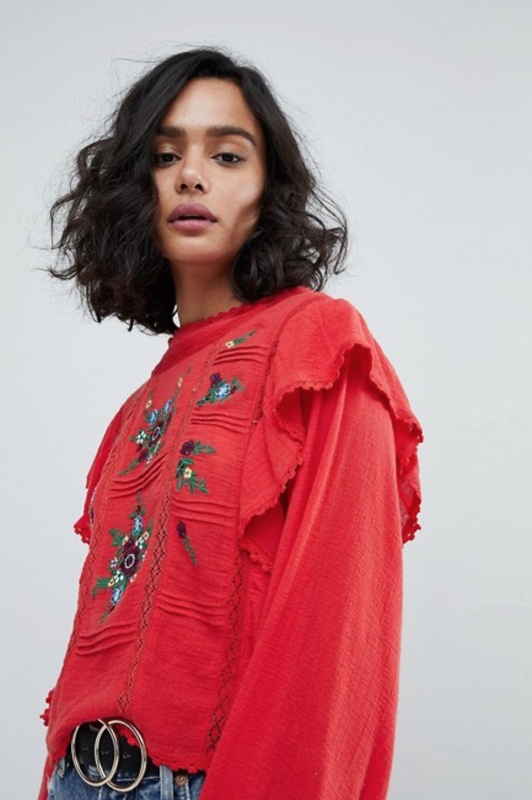 Embroidered Sleeve Boho Top - now reduced! 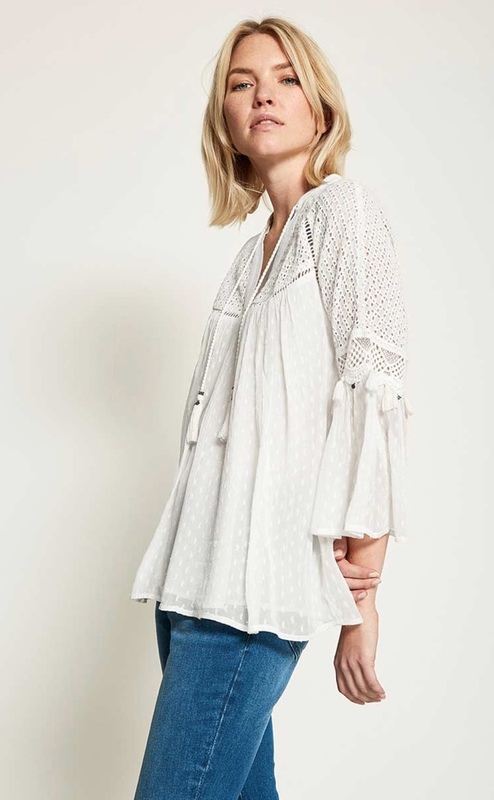 Or if you prefer something a little plainer then you'll love either the above off white number that has embroidered sleeves. 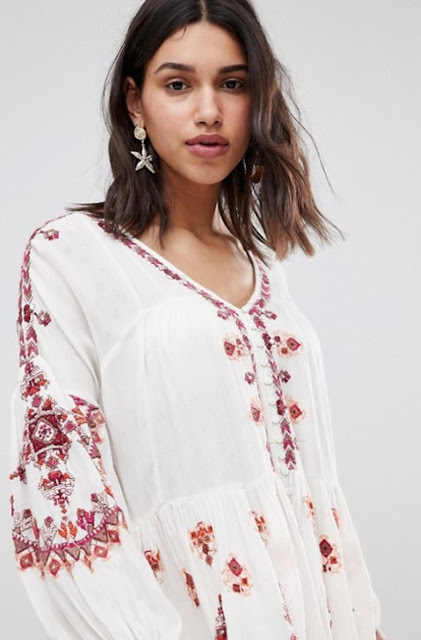 Or the above tasselled beauty, which has a little extra detailing. Moving onto some blue options now that look great teamed with light blue denim as much as white trousers/shorts. Or a little plainer with the above navy version. 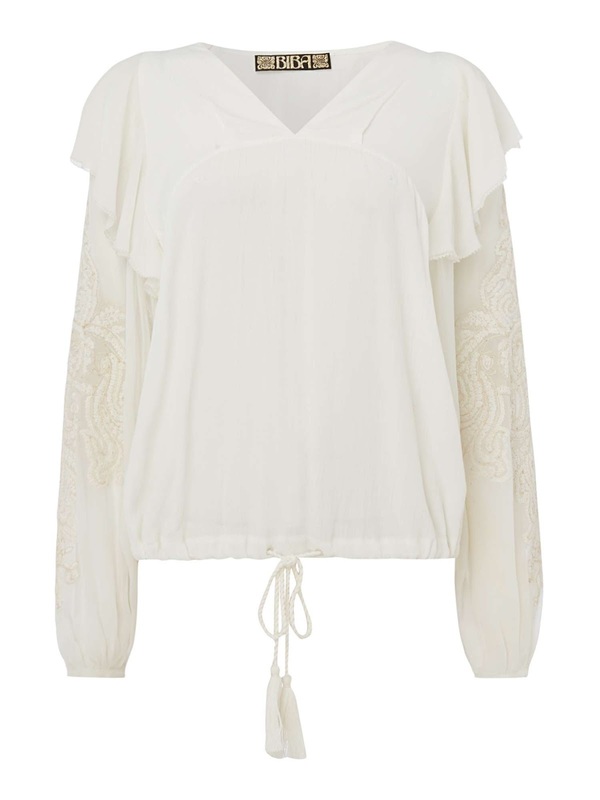 Boho Top With Embroidery Detail - now reduced! 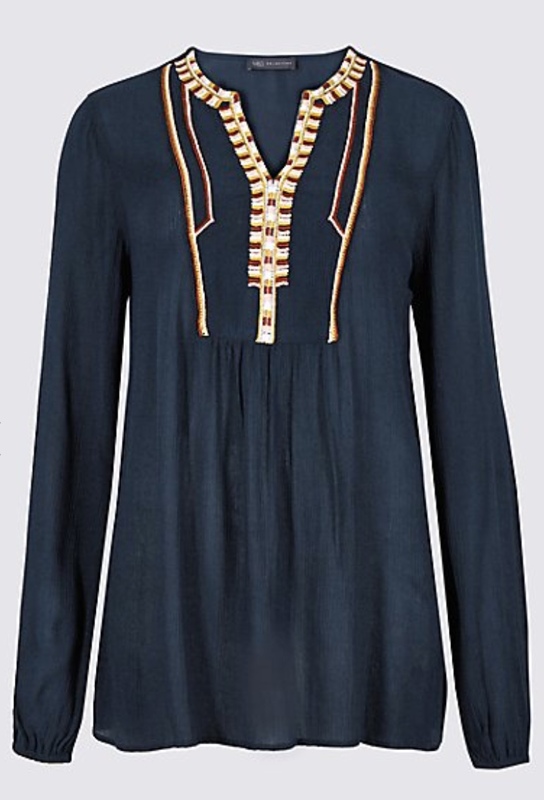 Or if you wear more black to navy then perhaps the one above. Or for a more patterned number, what about this one? And finally one that may have just found a new home in my wardrobe. Green with metallic gold thread what's not to love. Perfect for wearing on its own with some gold layered chains or teamed with a white tank tee/lace trim cami. Back to today now & it's all about those simple wardrobes staples - a tailored chambray shirt styled with some crop flare chinos. So ladies what are we thinking? 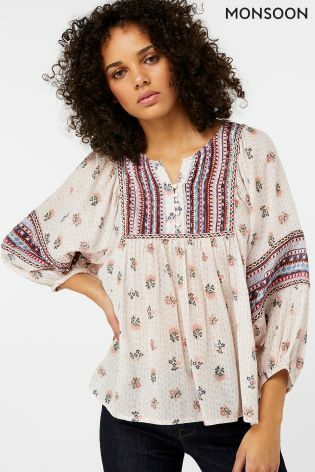 Are you a lover of the boho top? If so how do you prefer to wear yours? I personally wear mine more with jeans but have occasionally been known to throw caution to the wind & team with a pair of shorts if the weather allows. If you've not taken advantage of Boden's 25% off campaign it's the last day. To see today's offer just click here. Enjoy your day ladies & I'll see you as always in the morning.